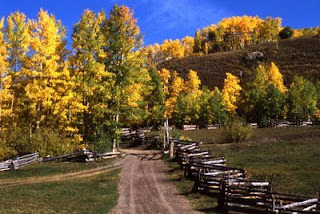 Split rail fences zig-zagging into golden groves of aspen. Chocolate brown horses stepping across a meadow. A tangerine alpenglow melting over the top of a nearby mountain. Those are some of the hues of a typical fall day around some dude ranches. You see, not all of the ranches close for the season at summer’s end. Of course in Arizona, fall color is given a twist. At Grapevine Canyon Ranch, where Chiricahua Apaches once roamed, the sagebrush after a rainfall gets a tangy scent and a freshly-washed, gray-green hue. “Now the ranch is covered with tall, silvery grass that is at the legendary stirrup height,” says owner Eve Searle, “and there are lots of wildflowers only now beginning to fade away.” October and November is also time for cattle round-ups, and guests are welcome to help. And up in the White Mountains at the Hidden Meadow Ranch, one seasonal high point is the Wild West Rodeo Weekend, (Oct. 17-19); team penning is one of their best events of the year. Another highlight is the HMR Winemaker Weekend (Oct. 24-26): A Taste of Rebel Vinum, and including a five-course dinner. But ultimately, you could say that fall’s main color is green (rates plunge after September 5, saving you lots of green). So as October weather brings a chill, remember that it also brings a palette of colors to ranches everywhere.